Author(s): Rupinder K. Gill, Ramandeep Kaur, Gurneet Kaur, Ravindra K. Rawal, Anamik K. Shah, Jitender Bariwal. Department of Pharmaceutical Chemistry, ISF College of Pharmacy, Moga-142 001, Punjab, India and Punjab Technical University, Kapurthala-144 601, Punjab, India. Tubulin represents a potent target in cancer chemotherapy. 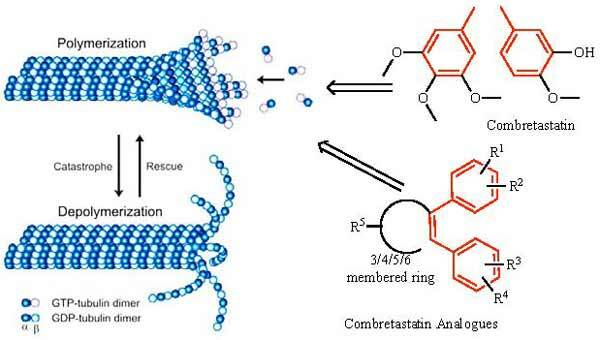 Combretastatin is a naturally occurring well known tubulin polymerization inhibitor. Combretastatin and its analogues have been discussed in this review in detail. For better understanding, this review is subdivided as per the carbon distance between to the two aromatic rings. Under these heading, various synthetic analogues, general synthetic route, their brief SAR and structures of the most potent compound has been discussed. This article will be a good platform to guide the chemist to design and synthesize drug like molecules for tubulin polymerization inhibitory potential with optimized pharmacokinetic profile. Keywords: Anticancer, antiproliferative, combretastatin analogues, combretastatin, microtubule binding agents, tubulin binding agents. Affiliation:Department of Pharmaceutical Chemistry, ISF College of Pharmacy, Moga-142 001, Punjab, India and Punjab Technical University, Kapurthala-144 601, Punjab, India. Keywords:Anticancer, antiproliferative, combretastatin analogues, combretastatin, microtubule binding agents, tubulin binding agents. Abstract:Tubulin represents a potent target in cancer chemotherapy. Combretastatin is a naturally occurring well known tubulin polymerization inhibitor. Combretastatin and its analogues have been discussed in this review in detail. For better understanding, this review is subdivided as per the carbon distance between to the two aromatic rings. Under these heading, various synthetic analogues, general synthetic route, their brief SAR and structures of the most potent compound has been discussed. This article will be a good platform to guide the chemist to design and synthesize drug like molecules for tubulin polymerization inhibitory potential with optimized pharmacokinetic profile.